The perfect end to any Tex-Mex meal, or any other meal for that matter, is that cool, smooth, creamy, dreamy concoction known as flan (rhymes with bon, as in bonbon). Let us extend the celebration of Cinco de Mayo to encompass this world class dessert. Flan looks and tastes like a gourmet treat. At heart, though, it is a simple but rich egg custard baked in its own caramel sauce. Called flan in Mexico and Spain, it is known as Crème Brûlée in France, and is served all over Europe and the Middle East. 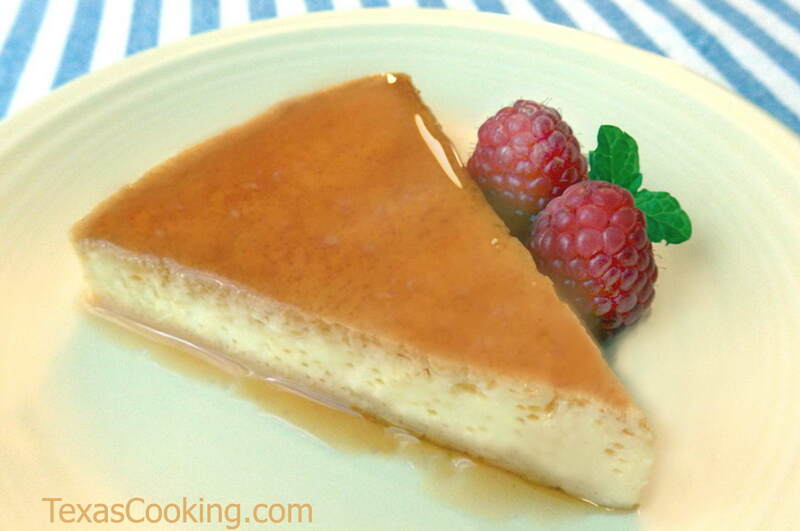 Caramel Flan, listed below, is the basic flan recipe of which there are many variations. Several other particularly delicious variations are listed below. Bring any of these flans into your dessert repertoire, and I think you will impress even yourself. Next is the matter of the pan. I went out and bought a 9-inch aluminum cake pan that I use only when I make flan. Since it doesn't get used for anything else, it stays nice and shiny. Make a hot water bath for the flan by setting your 9-inch cake pan in a larger pan (I use the broiler pan that came with my stove or a nice big sheet cake pan is good). While holding the cake pan down, pour water into the larger pan until the water level comes to within a half inch of the top of the cake pan. Then remove the cake pan and put the larger, water-filled pan into your preheating 350°F oven while you mix the flan. Be sure the pan is at the horizontal and vertical center of your oven. While you're at it, remove any oven rack that may be above the center rack. This next step is a real time-saver. Caramelize your sugar directly in the flan pan. Put the 1/3 cup sugar into the pan. Using a good oven mitt or tongs you can really grip with, hold the pan just over or just on a burner at medium heat. (Here is another of those times when a gas stove has it all over an electric one.) Shake and tilt the pan, rather than stirring the sugar. Watch it like a hawk. The sugar will begin to melt (keep shaking it around), and then begin to caramelize (darken in color). Don't let it burn, but you do want it to be a nice, deep caramel color. When all the sugar is caramelized, tilt the pan until the entire bottom surface is coated. Remove pan from the heat and allow to cool. The caramelized sugar will harden almost immediately, and may even crack. That's okay. Now, beat the eggs with the 6 tablespoons of sugar until well mixed; add the milk and vanilla and whisk well. Pour the mixture into the caramel-lined pan. Bake for about 25 minutes. Test for doneness by gently pushing flan in the center with the back of a spoon. When done, a crevice about 3/8-inch deep will form. Remove flan from the hot water bath and chill at once. As the flan cools, the caramel dissolves. When the flan is completely chilled, loosen the edge by carefully running a knife around the inside of the pan. Cover the pan with a rimmed serving plate, and quickly invert. The flan will slowly slip free, and the caramel sauce will flow. You will be very happy. To serve, cut in wedges and spoon on caramel sauce. This is one of the world's great desserts. A perfect complement to a dinner you want to be special.